I recently opened up Instagram stories asking for questions related to homeschool. Wow, what a response! Funny enough, most of the questions overlapped quite a bit with the most popular by far asking why we chose to homeschool and how long we plan to do it. My answer is long and I didn’t want to try and squeeze it all into 15 second video snaps, so I opted to answer it here instead. So here’s how we got to where we are today! When I was growing up, homeschool wasn’t something I ever heard about. In fact, I barely knew a thing about private school. It was more like, you just went to the school, the same one everyone else went to. I had a very positive public school experience. I was social, captain of my competition cheerleading squad, and in AP classes. From a child’s perspective, it was overall a very positive experience. When I got pregnant with Hailey I imagined having five years at home with her until I’d send her to kindergarten. I still had barely heard of the idea of homeschooling at that point, much less thought about it myself. We enrolled her in preschool starting two mornings a week at age two, then three mornings at age three. Around this time I remember David telling me about a guy he worked with who homeschooled his two girls. We both were intrigued by it. At first I was in awe and wondered how this mom knew what to do; I assumed the mom must have been a teacher previously. Then I wanted to know why they opted for homeschool. Then I was curious how they liked it and if the kids were bummed that they didn’t go to regular school. Basically, all the same things anyone I’ve ever talked to about homeschool wonders when they first encounter the concept. After many conversations about the pros and cons of homeschooling and talking to a coworker of David’s and a couple friends of mine about it, we both agreed we liked what we were hearing. We decided to dip a toe in. Hailey was entering her last year of preschool and had a few options to choose from: five, four, or three half days a week. We took the three day a week option so I could spend the two days at home with her “trying homeschool.” I alternated the girls’ days so the two days I was at home with Hailey would be the two days Kaitlyn was at her morning preschool program,allowing us to have one-on-one time for this trial period. It went just fine. We read and played in a relaxed fashion, loosely following and enjoying The Homegrown Preschooler program, but I still doubted myself and my capabilities for how I’d do when it came to really homeschooling full time. I researched local schools and found a charter school that aligned beautifully with our educational philosophy. However a lot of people feel similarly apparently because the lottery and wait list for kindergarten usually climbs into the 400’s easily. I decided it was worth a try, despite the low odds. I went to two open houses. I started reaching out to parents that attended the school to get the inside scoop. I even set a meeting with one of the directors of the school where I not-so-gracefully asked if there was a job I could take on from home (because employees’ kids automatically get in). I loved this school. We entered Hailey in the lottery and figured this would be the deciding factor; if she got it, great! And if not, we’d homeschool. I woke up at 12:00 AM the day the lottery results were released, grabbed my phone, and held my breath as I started to scroll. Then I saw it- her number- listed as ADMITTED! My heart stopped but to my surprise, my emotions were mixed. I felt extreme joy and luck, but also a twinge of oh… ok, so no homeschool. I put my phone down and let my mind wander through the possibilities of both paths that David and I would have to decide between. Then I grabbed my phone just to double check the list- after all it was just grid of a lot of different numbers. I pulled up Hailey’s registration number again to double check and realized I was off. She was not on the admitted list. She was number 382 on the wait list. Talk about an emotional roller coaster in the middle of the night, but it ended up being a fortuitous sequence of events because even though I was truly sad that she didn’t make the lottery, I got insight into my true emotions that revealed to me that I did want to homeschool, but was scared to make that jump on my own. I had wanted a reason to be forced to choose it. Now I knew we’d homeschool, and I knew I was excited about it, so I threw myself into researching and preparing. The trial preschool year had gone just fine, though it really felt more like playing school two days a week than “real” homeschool (whatever that means). Then when the time came to decide for kindergarten, my emotions went crazy again. All our friends were registering for school. True, a lot of them were splitting into different schools- public, private, charter, the university model school (school 3 days a week, at home 2 days a week), etc. But still, it felt really scary to watch this mass registration taking place and to simply sit it out. It felt a little lonely because I wasn’t able to participate in the “what teacher to try for” or “what time does the bus come” conversations. However, once the rush passed and summer arrived, I got more comfortable with the idea. I stopped saying “I think we might homeschool” and started answering with “we homeschool.” I redecorated our playroom to turn it into a homeschool room. I finally chose curriculum and ordered it. I felt as ready as possible. We started our first real day of homeschool in September so it aligned with Kaitlyn’s first day of three’s preschool. It was such an emotional day for me- you can read all about it here. But from there, I learned a little more everyday. I learned more about my child’s learning style. I learned more about my strengths and shortcomings in both parenting and teaching (which are closely related as homeschooling truly is just a natural extension of parenting). I learned to relax and embrace what I had been told- homeschooling is not trying to replicate school at home; it has its own beautiful rhythm and speed. 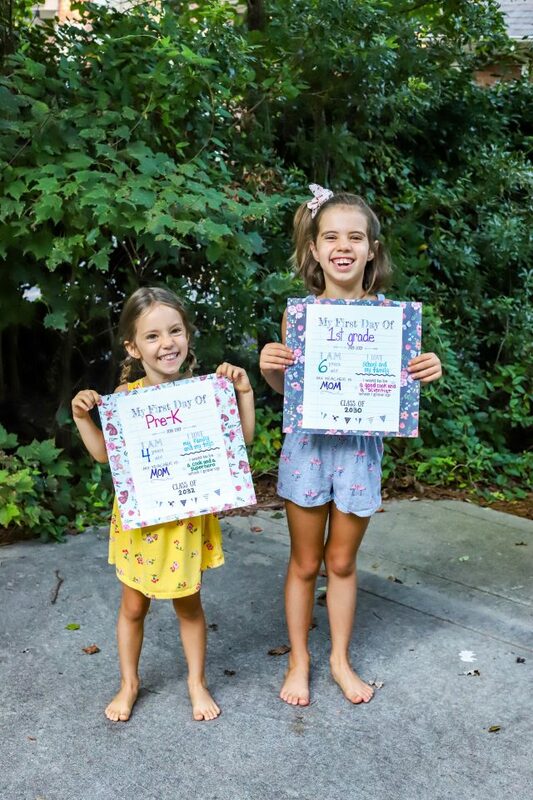 The year was so much fun and when time came to decide whether to send Kaitlyn to preschool for her final year or keep them both home, I opted to keep them both home. It was a hard decision because we all loved her preschool, but we were still having to get up, eat, dressed, and out of the house on someone else’s timeline. 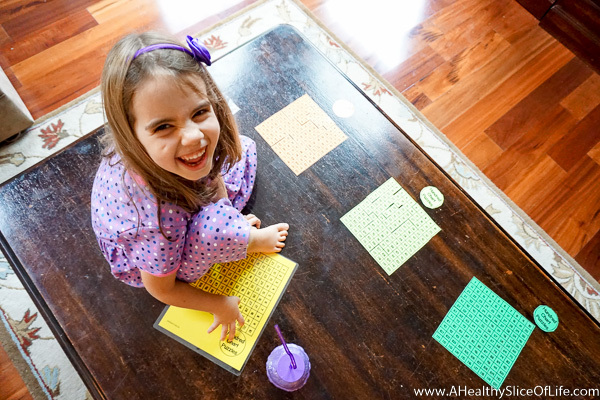 Deciding to keep both girls home was the final piece to our homeschooling puzzle. And here we are today! Hailey (7) is in first grade. Kaitlyn (4) is in her last year of preschool. We love homeschooling. It’s a natural and relaxed learning environment. We go at the speed each child needs, not having to rush through the challenging parts, but also allowing us to move forward in the areas that come more easily and naturally. It enables us to control not only their academics but also monitor the social, emotional, and leadership influences around them as well. We love the ability to enrich learning through extra experiences. Learning about dinosaurs? We can visit the dinosaur exhibit at Discovery Place. Planning a trip to the beach? Great, we can start studying the area we are going to visit and the things we might see. I get to learn, too! I can’t tell you how much fun I’ve had learning right along beside them for our unit studies on Japan and China and more. The flexibility of schedule. We can travel during off-peak seasons. We can start school in early August then take an extended break in December to focus on family and Christmas. We can sleep in when we need it or do school on a Saturday if there is something to cover. It allows the girls more time to just be kids. They spend a lot of their day running around and just playing and exploring. I believe kids need a lot of movement and creative freedom; homeschooling allows ample time for that. It allows us to follow and explore their curiosity. When Hailey was asking questions about space, we just went with it! Black holes, planets, solar systems, a planetarium visit, the works. It gives us the ability to spend time daily on life skills. Cooking, grocery shopping, knowing how to mail a letter, how to look an adult in the eye, household chores, handling money, etc are all skills we work on daily. Can you do this without homeschooling? Of course! It’s just that homeschooling gives us the time to make these party of our daily routine. We just really enjoy being with our kids. I love them, of course, but I really like them, too. We aren’t in the trenches of diapers and naps anymore so the time with them is fun and I love having a front row seat to watching their minds work through things. So the next most popular question after why we homeschool is how long we plan to do it. The answer to that is simply: for as long as it’s working for us. We commit to a year at a time. While some people ask me if I’m worried about how I’ll manage to teach physics, the short answer is: I won’t be teaching physics. The resources available for curriculum, online classes, online support, local colleges, class offerings from museums, co-ops, etc are incredible. Homeschooling today is overflowing with resources and options. And the one thing I know for sure is that no one cares more about not letting my kid down than me. Are there any drawbacks? Of course. There is no one perfect path. I’d love my kids to have the experience of language immersion for example, but for us, the pros outweigh any shortcomings at this time. 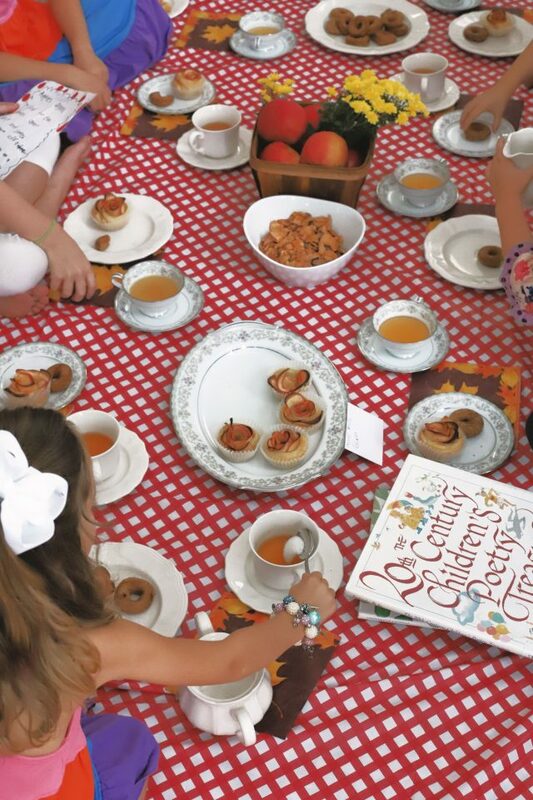 From our September Poetry Tea Time that we do monthly with friends. The joke within the homeschooling community is that we homeschool because of the socialization aspect, not in spite of it. I could write an entire post on this topic alone, but for brevity sake I will say that the majority of homeschool kids I know are incredibly well-socialized (whatever that means) because they are constantly interacting with all different kinds of people, of different ages and backgrounds, out in the real world. The term homeschool is slightly misleading because though it’s possible to spend a lot of time at home, we often are outside the home interacting with people in day to day life. The girls have friends they have playdates with, they enjoy the classroom feel they get weekly at co-op, they run up and make new friends at the playground with ease, and they get complimented on their manners quite often. So I guess the short answer is no, I am not concerned with socialization at this point in time. I think that covers our personal journey (in minute detail, haha), but I’m writing another post about the nitty gritty details: educational philosophies, resources, inspiration, legalities, how to get started, etc, as I’ve had a lot of people ask about that. I hope this has answered the question of why we homeschool. I’m always happy to share our perspective and our choices, but please know that as with everything in parenting and in life, these decisions are complex and personal and by no means do I think there is one right way to do things. What made you decide between a charter school vs. homeschooling and not the local public school? I live in NC as well and while not all schools are great, I know the ones in/around Charlotte are very good. I’m curious what factors with the public schools led to that decision. We have a rising kindergartner and all the different opinions are very helpful to hear. Hi Kelly! We actually had planned to go to public school until we heard about homeschooling. 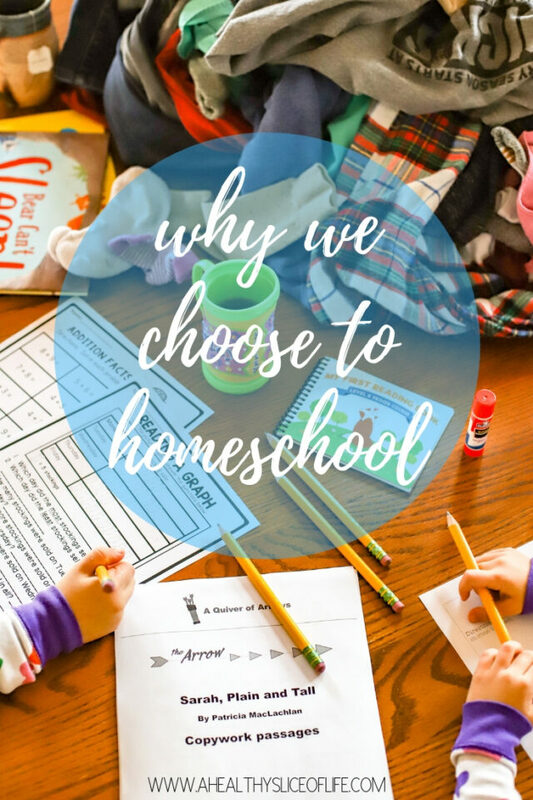 It was never an intention to stay away from public; we just happened to love the idea of homeschooling then found a charter that was wonderful enough to catch our eye before ultimately deciding homeschool was the right path for us. I hope that helps! I think my concern with homeschooling is that the kids thrive within the very carefully selected environment that the parents create for them, and they aren’t necessarily exposed to situations or people who may push them outside their comfort zone. For example…..my 7 year old tends to be on the reserved side, so standing up in front of 20 of her classmates and discussing a book she recently read makes her very nervous and uncomfortable — BUT, it’s expected of her as part of her daily classroom experience, so she does it and learns/grows from it. Another example is dealing with “mean kids” – nothing hurts my heart more than when my daughter tells me that so-and-so was mean to her on the playground, or she’s sad because a friend chose to invite another girl over to her house for a playdate and not my daughter. But again – I think learning how to deal with those situations is an important part of normal growth and development, and it actually benefits her that I’m not there all day to step in and help her figure out the best way to respond to these situations. I’m not saying that these scenarios don’t ever come up in a homeschool environment, but I also think it’s more likely than not that homeschool parents naturally tend to plan activities and playdates with parents/kids that they/their child enjoy spending time with, and that the kids aren’t always pushed outside their comfort zone. Curious your thoughts on this? (Also, I firmly believe that every parent makes the best choices that work for them and their family, so please know this is not intended as criticism or judgement in any way – I just personally see this as a downside to homeschooling but am curious as to your perspective!). To the questions christina asks^^^^ first the honest answer is that some homeschool parents do homeschool to protect their kids from challenging situations. However, I’ve seen the parents of public school kids interfere plenty to make sure their kids don’t have to deal with difficulties, throwing parental fits when their child is required to follow a rule or do something hard. So let’s just agree it’s not homeschooling nor public schooling parents that particularly seek to protect their kids from doing hard stuff. Homeschool parents seek challenging opportunities for their children and create cooperative educational opportunities all the time. They sometimes meet once a week for just such opportunities. There are homeschool speech and debate leagues, homeschool athletic leagues, scouting, political leadership camps, youth groups, theater groups, charity volunteering…. there are a myriad ways homeschooling families accomplish the same thing. I DO plan activities that my kids enjoy. Like everyone. My son has done scouts, theater, speech and debate, political leadership workshops and charity volunteering. These activities have thousands of kids. There are people he “doesn’t like” that he must learn to work with in many aspects of his life. Additionally, they don’t really learn to be cliquish and “not like” people quite do much. All I can say, after 15 years of homeschooling, the vast majority are very well adjusted, have learned to work hard and are just fine at handling new situations and are no more or less capable of being around people and situations that rub them the wrong way. As a parent, I literally just really like and enjoy my kids and want to be around them. I homeschool because of that reason. Ive gotten to see and enjoy every milestone up close and personal. I homeschool through high school! It has been a total blast. The kids are normal! Able to get into college and hold real grownup jobs, and there is the proof that they learned how to handle themselves in public. I have homeschooled my children for 4 years now. The oldest is 9, the youngest is 2. I can say that as far as being “exposed” to situations like you have mentioned (bullying, people or experiences that wouldn’t be comfortable for them), 1. My kids experience a good part of the time. We have cousins and friends from various areas of life, and I can tell you with certainty that my kids are learning early on how to deal with and love all kinds of people! 2. 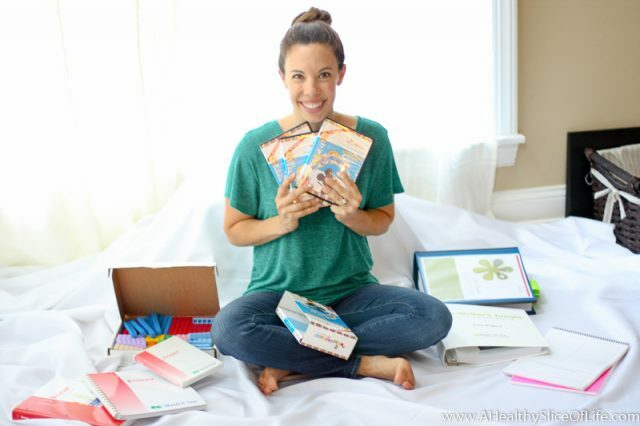 A homeschool co-op would be great for differing educational experiences like what you mentioned, and many mom’s (and dad’s) use co-op for that purpose. Myself included! 3. I think as homeschool parents, we actually are more intentional about what our children are exposed to, such as bullying, cooperative play between kids, people of different backgrounds, etc, and we value those things more than a lot of parents who’s children are in regular school, and might take those things for granted. We limit what needs to be limited (exposure to violence, drug use, etc), but push our children to talk and play with people who are different. I think in general, homeschool parents value imdependence, variety, and well-rounded upbringing more so than other parents, simply because we are, and have to be, intentional about it. So I wouldn’t worry about lack of experiences with homeschool. They are there, you just might need to look for them! But often times they fall right in your lap! I agree with the other reply to this comment. I had someone explain it to me this way once. Do I believe my small children will learn how to behave from other small children or from me and the other people we choose to be around? When they are young, they have no idea how to handle complicated social situations. I have two young adults who’ve been home schooled from kindergarten on up and we constantly have other adults tell us how self confident and pleasant they are. They have not lived without struggles. They have been helped and taught through every struggle because we were there for all of them. It’s so intriguing to me to homeschool. Especially in California where the school system is just not very well ranked. I think what you do is amazing. The socialization aspect makes me laugh. I have a friend that was homeschooled from K-12 and she is one of the most social people I know. She went off to college just fine and became a physical therapist where she interacts with people every day. I think that’s an old mindset of thinking that the kids won’t be socialized. Even my one year old likes to be around other kids and she doesn’t go to school. I think for some it just comes naturally. Who knows though. Very interesting post. Thanks for sharing. What a wonderful post! We decided to start homeschooling our daughter mid way through her second grade year. That was 9 years ago! I’ve loved every minute of it. And still do! She is now enrolled in a university model school, so we still have the benefit of her being home 2 days a week. But also, her school is very open to travel and if a student learns better a different way than what is taught, great! There are just too many different ways for kids to learn and they are all so different. Enjoy these days and years with your girls! Very interesting post, and I will be curious to read future thoughts/perspectives/experiences on homeschool. We have considered homeschooling many times for my now-1st-grader and preschooler. For now, we have chosen private school, but that’s not to say we won’t switch things up with schooling in the future. It is wonderful that you have found a educational system that works for your family! I am a charter school math teacher, with an ultimate plan of teaching public high school math. Our city has some amazing public schools. And I know that because I love teaching in a school and the school culture as a whole, I am biased towards it, but I do feel whatever works for the individual is the right choice. One of your reasons for choosing home school, is actually a reason (or opposite reason) I will support public school for my own kids. As a teacher myself, it would be really easy and natural for me to want to control their academics, and monitor the “social, emotional, and leadership influences around them as well”, but personally this is the opposite of what I want to do. Maybe it is part personality based; I am fiercely independent and at the same time whatever the opposite of a Type A personality is (type Z maybe??). I support our public schools because of its beautiful diversity. I want my boys to understand for themselves the dynamics of different social circles and influences, so that they can ultimately make the right choices based on their own observations (my most important influence is to be a good role model). I look back on my own childhood and upbringing and so appreciate my parents for allowing me to make mistakes, fail, and at times, make the wrong (bad) choices. They were the experiences I needed to have to be able to make the right choices in life- conclusions I feel that I wouldn’t have come to had I never had the exposure. I feel if I were to aim to control these aspects in their life, their life would be what I made of it, instead of what they made it to be. And then, there is the magic and beauty of the classroom. I think if I was not a teacher, and only read about the negative of our educational system, I might have a different view, but this amazing thing of teaching and learning in the classroom is what keeps me coming back every day, and will probably keep me teaching until I’m in a walker 🙂 I just so love it. And probably not a surprise, but in general, I do not support online education. When I was in college, I did take a few just to lighten up my load, and simultaneously earned A’s in those classes while also gaining (and learning) nothing. I know that online courses have probably gotten much better, but for me, nothing is better than the collaborative environment of a classroom, where students bounce ideas around, debate, and gain understanding of how their own and others backgrounds influence decisions. I can’t talk education without getting a bit philosophical and passionate, but thanks for opening up this discussion and for your honesty about your own journey! I love to talk education, and really appreciate hearing views that differ from my own. I love hearing your perspective, Laura, and can only assume how lucky your students are to have such a passionate and caring teacher- you are awesome! I loved hearing your perspective as well! One thing that might have been taken out of context is my “pro” about controlling their environment. I totally see how it could be misread as making sure they don’t ever face adversity, but it’s quite the opposite. I can ensure they do have certain challenges that are developmentally appropriate that they may not encounter in our particular public school district. Thank you again for your thoughts, as I really enjoyed reading them! Thank you for clarifying, that makes sense! I have to say, you really sell this! I have been a teacher for ten years in a really great school district. The education you are providing them is on par with what we do in my district; it is clear from the time and thought you put into planning instruction and connected activities that you are encouraging curiosity in the world. That, along with the idea that learning is fun and that we should approach life being lifelong learners, are my goals as an educator. Even though you don’t have formal education in homeschooling, your curriculum and approach sound amazing. I am especially envious of the connections you are able to make. Being so attuned into what they are learning allows you to point out connections when you are “outside school” and will result in a much stronger impression in the long run. Keep up the great work! Thank you for your comment, Meg! I work my tail off to try to ensure I don’t let them down, so the encouragement from an outside perspective really means a lot to me. I love that you have been able to bring the idea of being a life long learner to so many students in your teaching career. That’s a concept I’m passionate about as well. Keep up the amazing work! I love this post! As a former public school teacher (who LOVED teaching in the public school system!!) I now have the joy of homeschooling my own boys. I am incredibly thankful for the time and opportunities we have as a family since our boys are homeschooled; however, I don’t think we’ll fully understand the beauty of making daily memories together until they are much older and we can look back on this special time. Kudos to you and David for researching and feeling confident in your decision! Do you worry that your kids will be “behind” if they eventually start at a main stream school? I don’t mean that in a judging way at all! I’m a former elementary teacher and mom to two little boys, so I’m just curious about your thoughts. What makes you believe they would be behind? Are you implying she doesn’t monitor their progress? I have wondered the same thing. From what Brittany posts regarding their home schooling, the girls certainly don’t put in the same amount of time that students who attend full-time school do. To each their own, but I have wondered how the girls can possibly get the same type of education at home as they would in a real school setting. Most kids attend school 5 days a week, for full days, and Brittany’s definitely do not. Legit thoughts, not being a jerk here. I do have a question for Brittany, while I’m here! Do you ever worry that you are setting your girls up for a rude awakening one day? While what you and David do for them is beyond generous (vacations, relaxed days with pajamas and baths and movies just because you feel like it), that isn’t what real life will have in store for them eventually. While you can “control” certain aspects of their lives now through homeschooling, that won’t be the case forever. This goes beyond being able to socialize with others, I’m thinking more real life skills – like having to get up each day and be on time to classes in college, or needing to show up to a job every day, even if you don’t feel like it. I don’t know, but personally, to me, it all just seems like this type of coddling is what creates the snowflake mentality we are seeing a lot of these days. It would take too long for me to go into the research I’ve read on how much time is spent on non-educational activities during a standard school day, but I feel very confident that the private tutoring my girls get for 2-3 hours a day fulfills their educational needs quite well. In schools there is a lot of time spent on disciplining children, lining up, distributing supplies, switching activities, teaching to different levels and abilities, etc, etc, etc which is just the nature of teaching a classroom of children. There is nothing wrong with that of course, but it fills time with activities we don’t have to deal with at home. I’m also quite confident in my girls’ “real life” skills. While they do have the luxury of sleeping in and wearing pajamas, they are far from coddled. I believe the snowflake syndrome you speak of is a product of lack of responsibility and entitlement, both of which we do not endorse. Manners, respect, and responsibility all begin at home, not when they walk through the doors of a school. Completely agree with your response, Brittany! Well said. Do your girls ever ask to go to school? We live in a young neighborhood with lots of kids so my kids have been waiting to go to school so they can be like the big kids on the street. It’s also interesting different kids personalities because I have one friend who home schools and her 2 oldest boys, in high school were fine with it, but the younger wanted to go to public school for the experiences. He wanted to ride the bus, eat at lunch and be in the band. But the other 2 never had these desires. They haven’t, which surprised me because they both went to preschool for at least some amount of time, but I think they fact that we have so many friends that do school differently, they don’t see themselves as being outside the mainstream because there really isn’t a mainstream in their eyes. They have friends that homeschool, public school, private school, and attend the university model. What kind of report do you have to provide to show what the girls are learning? Are there minimum minutes per week? How about standardized testing? I’ll address all of these in my upcoming post about the bells and whistles! In short though, homeschooling requirements differ by state. What a wonderful, informative, and open post. I’m sure you have answered questions that many others are having, and probably inspired others to look into “home” schooling. You are perfect for the role you have taken on! You can do language immersion as a homeschooler! I’ve been homeschooling my daughter for high school. We are finishing her senior year this spring with a two month stay in France for French immersion along with shorter trips to three other countries. All of her other classes are complete, including Calculus 1. She has several merit based scholarship offers from colleges she’s applied to and is waiting to hear from a few more. That is incredible!! What an experience! We just found out about an opportunity for the girls to possibly take Spanish next year, so I’m continuously impressed with the opportunities becoming available. Research puts homeschooled kids ahead academically. Unless kids are not truly being educated, academics are one of the reasons *to* homeschool. If we’re honest, this by sheer numbers, is more of a government school problem (i.e. educationsl neglect). I have a question about reading series I know some children struggling in school with their reading. Do you think your programs would be a good supplement at home ? Hi Jean, I’m not sure I understand your question, but I think a parent working one on one with their child on reading is always a great idea! Love this post, mama! We are in our 3rd year of homeschooling and absolutely love it! Thank you so much for this! My son is only one and a half, but this is something I have thought about already, and I appreciate the information you have given here. I’m a new subscriber and this was an awesome first read! Hello! You are dipping a toe in at the perfect time because you have SO much time. For preschoolers I love the The Homegrown Preschooler or the Peaceful Press which are gentle and fun “curriculum,” but above all, play is my favorite thing for young kids above everything! If you are on facebook, it’s a great place to start searching around for local homeschool groups. A lot have play dates at parks over the summer so you can start to meet people. Also, go ahead and look into the laws of your state, just so you are familiar and comfortable. I found it was tough to find that first “thread” into the community, but once you find one, a whole world opens up! Best of luck to you! This is late to the program but I had a question: one of my biggest concerns in homeschooling is how the parent-child relationship will be affected by the teacher-student relationship. Do you ever have problems with the girls not wanting to do their work or seeming to resent you?? We have homeschooled preschool and while We have enjoyed it, I worry about the long term affect homeschooling will have on our relationship. We also had a family crisis over the summer and I was essentially out of the picture for a month while my son had heart surgery. Schooling was halted and I fear that, if something like that were to happen again- or if something were to happen to me- she would be out a mother AND a teacher. Thoughts?? Hi Shauna, these are great questions! I’m including them in my follow up post on homeschooling + FAQ which I will post later tomorrow (2/7).